I was taken aback. My goal was to help vet the ideas and make sure they would work, but in doing this I was bringing the entire mood of the room down. From that point on, I started paying attention to the techs who worked with me, how they acted in meetings and how their ideas were received. I made an interesting discovery. Technicians have a natural bent to the negative. While we think we are helping the situation, by being negative, we are actually hurting how people respond to us. Negativity will cause people to discard our opinions and stop inviting us to meetings. This results in a breakdown in communication that could cause even more problems. Once I realized this, I resolved that I was going to figure out how to communicate in a way that did not come across negatively. I was going to declare war on negativity! Stopping negativity is a mindset. Start every day with a decision that it’s going to be a good day. Verbalize it. As you attend meetings, smile and listen to what others have to say. Have a mindset that ideas being presented are always good. It’s the logistics that tend to get in the way. Plus, most people throw out big ideas with the anticipation of collaboration. Tell the person they have a great idea, then try to gain some context on what they want to accomplish. Understanding the context will help get to a result that works for everyone. For example, someone had an idea of driving a car on the stage to make a point. The idea was awesome, we just didn’t have the ability to get a car on the stage. I told the person that the idea was amazing and asked them to provide some context on why they wanted the car on the stage. After some discussion, we landed on doing a video of someone driving the car and making the same point in a way that was doable for our resources and stage abilities. The key was being positive about the idea, gaining context on the point of the idea and discussing a mutually beneficial solution. Another way to avoid negativity is to filter any challenges to a presented idea with the premise that I may be wrong. If you ask yourself, “What if I’m wrong?” before you challenge someone else’s idea, you will find yourself speaking more positively to their idea. It makes collaborating with them easier. It’s our job to make sure the logistics work. So I get it, we have to find the issues. But I think in doing so we can tend to move too far into the negative and sometimes even use sarcasm. If you want to defeat this cycle, speak positively. Questions are an amazing way to understand context while promoting a positive agenda. For example, you are asked to provide a microphone for every single choir member. Instead of saying, “we can never afford that,” ask “what budget do we have for that?” If they don’t have the budget, you might suggest recording the choir to get a better sound and using that to beef up the existing microphones. Speaking positive and asking questions that positively move the discussion forward is an art. The more you train your brain to talk like this, the better you will do in meetings, relationally engaging people and moving forward a positive agenda. Let’s take our lead from Jesus. He was the most positive person that ever walked the earth. Even when He was on the cross, He asked the Father to forgive us. In everything He did, He pointed to the positive. In Matthew 5:16, He says to let our light shine before others, that they may see our good deeds and glorify our Father in heaven. It is clear He wants us to be positive and to defeat negativity. He knew that if we did, our light as Christians would shine and we would be a witness to others and defeat any issues that confronted us. David Leuschner currently serves as the Executive Director of Digital Great Commission Ministries, a non-profit that has a mission to utilize technology to reach the entire world for Jesus Christ. 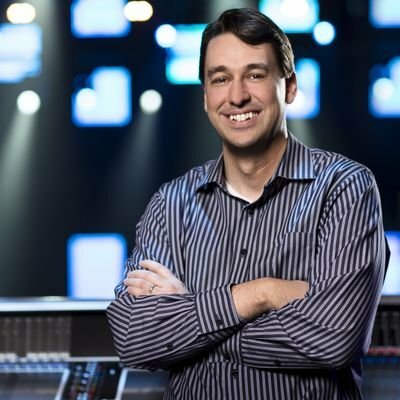 From 2006 to 2017 he served on the Senior Team as the Senior Director of Technology and Technical Arts at Gateway Church. He provided oversight for all of the Technology and Live Production areas. While at Gateway, David guided and directed over 700 volunteers, part-time and full-time staff in a mission to facilitate several hundred events a month among all venues.